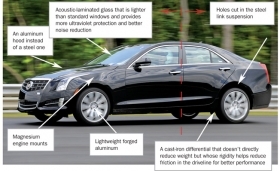 As they developed the new Cadillac ATS sedan that goes on sale this summer, General Motors engineers paid special attention to curb weight. They also paid close attention to the weight of the car's German rivals. "We designed and engineered the ATS's vehicle architecture to deliver quick, nimble and fun-to-drive dynamics," ATS chief engineer David Masch said in a statement. "We distributed mass to key areas. This enabled the ATS to achieve the performance characteristics that luxury sport-sedan buyers demand." What the ATS team came up with was one of the lightest luxury sport sedans, weighing about 3,400 pounds, with a 50:50 weight balance. The BMW 3 series weighs a few pounds more, at 3,406; the Mercedes-Benz C class weighs 3,428 pounds, and the Audi A4 weighs in at 3,704 pounds.